FACT CHECK: Crime in Sweden, Part III: Does Sweden Have 'No-Go Zones' Where the Police Can't Enter? Crime in Sweden, Part III: Does Sweden Have ‘No-Go Zones’ Where the Police Can’t Enter? There are "no-go zones" in Sweden where the police can't enter. The shocking attack [of bottles being thrown at police] on the on-duty officers is just one of many incidents, as officials have placed more than 50 areas on a ‘no-go zone’ list where they admit they do not have control. Lawless thugs are wreaking havoc unchecked, and officers are often at personal risk when entering the crisis-hit areas. But Swedish police were quick to tell us that these so-called no-go zones do not exist. The term originated with newspaper columnist Per Gudmundson, who used it to refer to a police report identifying “problem areas” in the country, where there is a criminal milieu. In these areas, there is high crime, low socioeconomic status, and lack of social integration and cooperation which presents a special challenge to police. 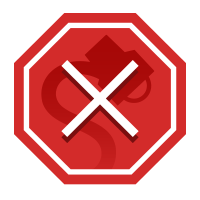 But Erik Jansåker, a police chief in Malmö’s southern areas (the city is often singled out as a high-crime area), told us that the term “no-go zone” never appeared in the report itself – and Gudmundson admits as much in his column. However, since he used it, the term has taken hold in the popular imagination. Jansåker’s jurisdiction includes two “problem areas,” Malmö neighborhoods Rosengård and Seved. He told us that local investigators have been overwhelmed with the caseload from 14 recent murders — 8 to 10 in the same time span would be normal for the area – but that there aren’t areas where police can’t go. To drive the point home, one of Janåsker’s employees, Officer Johannes Schultz, took us along on his regular foot patrol of Rosengård. He walked briskly and frequently stopped to greet or chat briefly with citizens. One little boy stepped in his path to ask for a high-five, and Schultz happily obliged. Another child on a scooter smiled at him and sought his attention by calling shyly, “Johannes!” Schultz said hello. People were out walking and children crowded playgrounds. 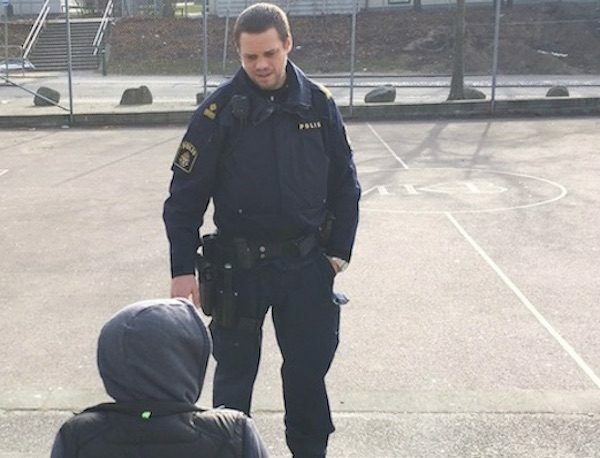 Swedish police officer Johannes Schultz stops to talk to residents in Rosengard. Joakim Palmkvist, a crime reporter for the local newspaper Sydsvenskan, explained that what police call “problem areas” are places where criminals have basically set up a parallel society. It presents a challenge to the work of investigators, not because they are seething pits of violence and anarchy, but because they do not communicate or cooperate with police. Palmkvist explained the phenomenon by using the example of a 19 year old who escaped from one of the country’s juvenile detention facilities after being convicted of manslaughter. After escaping, the teen was completely off the grid for four months, in which time he allegedly managed to kill a person. Two months after the murder, he was apprehended again. In the meantime, Palmkvist recalled, “Nobody has seen him, there were no transactions, no visa cards, no phone, no contact with relations — he’s obviously been sleeping somewhere, eating. Somebody’s helped him.” But authorities don’t know who. Still, Schultz took us through a busy shopping center in Rosengård where he says new shops are opening up. As in other parts of Sweden, most people here travel on foot or by bicycle. In addition to our foot tour of Rosengård with Schultz, we visited Rinkeby, a suburb of Stockholm. Like Rosengård, it was lively during daylight hours, with young schoolchildren out playing and people everywhere bustling about. Most/all of our ‘worst’ neighborhoods indeed look and feel quite nice and friendly. What has changed in recent years is largely the gang crimes, which manifests itself in shootings etc and in open drug markets. The open drug markets have spread across Sweden and are now quite common, but just a few years ago there was only a handful of them (at least that was well known) in the whole country. The open drug markets signal an unlawful society to most citizens, and thus make the problems with youth gangs etc (that has been around forever) seem more salient. The shootings and explosives add to this, as they signal that those youth gangs are also dangerous. So, while youth gangs have been messing around (congregating in public space & being rowdy over all) and committing crimes in disadvantaged neighborhoods forever, their crimes are now more visible, more present – and more violent, which makes the situation much more pressing for those who live in such neighborhoods. The “explosives” Gerell refers to are a series of attacks using hand grenades. The media has a big picture of Rosengård but it doesn’t reflect the reality. Certain presidents in the U.S. say that Sweden has a problem but they’re just jealous because this is top notch. First you have to clean your house before you can clean another. America has a lot of problems on their own. He should take care of those problems before he attacks Sweden. I don’t believe that there are ‘no-go zones,’ but I can understand why people feel like that. Because when something happens here in Rosengård, that’s a big thing in the media. So people that are never here, they read that. For example, maybe one year ago, three cars burned overnight in Rosengård and the same night one car burned in a pretty good area in Malmö. I couldn’t see one line in the newspaper about the other car. The next day the big news stations were all over it here in Rosengård. Svenska Dagbladet. 28 October 2014.